Heeft u een vraag voor Guangzhou Hoikong Boutique Hotel Chigang Branch? Tijdens uw bezoek aan Guangzhou zult u zich snel thuisvoelen in Guangzhou Hoikong Boutique Hotel Chigang Branch, dankzij de hoge kwaliteit en de goede service. Het hotel ligt niet zo ver van het stadscentrum: de afstand is ongeveer 1 km en het duurt normaal ongeveer 40 minuten om het vliegveld te bereiken. Met de belangrijkste attracties van de stad - zoals Southern Hospital Of Integrated Traditional Chinese And Western Medicine, Fuda Hospital, Living Mall - binnen handbereik, zullen bezoekers van het hotel de locatie waarderen. De faciliteiten en diensten, geboden door het Guangzhou Hoikong Boutique Hotel Chigang Branch, garanderen een plezierig verblijf voor gasten. Terwijl u verblijft in deze geweldige accommodatie, geniet u van faciliteiten als 24-uur roomservice, gratis wi-fi in alle kamers, faciliteiten voor mindervaliden, wi-fi in openbare ruimtes, parkeerplaats. Hotelkamers zijn zorgvuldig ingericht om het hoogste niveau van comfort te bereiken, met plasma tv, internet (draadloos), draadloos internet (gratis), rookvrije kamers, airconditioning in iedere kamer. Daarnaast garanderen de talrijke recreatieve mogelijkheden dat u zich tijdens uw verblijf kunt vermaken in het hotel. Met een ideale locatie en bijpassende faciliteiten, is het Guangzhou Hoikong Boutique Hotel Chigang Branch voor veel gasten precies wat zij zoeken. Mooi, schoon helaas geen bar. I would like to write my review to help all of you for this Hotel. 1.) The difficult way is how to find the hotel because it located inside the hospital area. Take the metro From airport Line3 to kecun station then change to Line 8 to Chigang Station take the exit C1 after exit looking for Mcdonald then walk to Mcnonald (it will help you to walking to the right direction) after walk for 30m. you will found the KFC on your right hand side, The Hospital entrance will be Next from KFC, Pls walk inside for 50m. you will find the Hotel. (For more easier print the photos of your of your hotel and show to someone around there they will tell you) 2.English problem all solved now, The staff during Day and evening Can speak english well, They call the Taxi for me, They find me the food location. You no need to walk out and find taxi, just tell them they will use the app to call taxi in for you. 3.This hotel is good for the fair what i worry i have find out during my trip ENJOY, THK Jack . Location is good- near to subway station, clean and nice room, helpful staff if only u can speak chinese (mandarin/cantonese), local food stalls and fast food available nearby within walking distance. Please take note that the hotel ONLY provide free shuttle to and fro Pazhou Complex during CANTON FAIR. For those attending any other expo in Pazhou, u will need to take subway yourself to get there. I do email them prior to my trip, as expected, no replies. We experienced a black-out during my stay, it happened at noon. I'm not sure how long, it was too hot in the room so i gotta get out from room. We were told by the staff it was the first time they experience this and the hotel doesn't have back-up generator. Good location. Cozy modern room designs & Cleanliness of the room. I am truly happy that I have stayed in this hotel for 5 nights. The location is good as its less than 5 mins walking distance to the subway. It's just 3 stations away from Pazhou exhibition, which I am really glad about, especially this trip is mainly for business trips to attend exhibitions at Pazhou. Best of all, there's quite alot of food stalls, restaurants and fast food like Macdonalds & a 24hrs kfc around this vicinity, we have no problem in getting food even if we are hungry during late nights. The stylish designs of the interior decor of the hotel rooms are sleek and cozy. Cleanliness is considered good and well maintained, however could be improved with fragrance spray during housekeeping, because the room has a little cigarette smoke smell, but i can still overlooked this factor as i felt the room is still very clean and cozy. Overall, I am happy staying in this hotel. 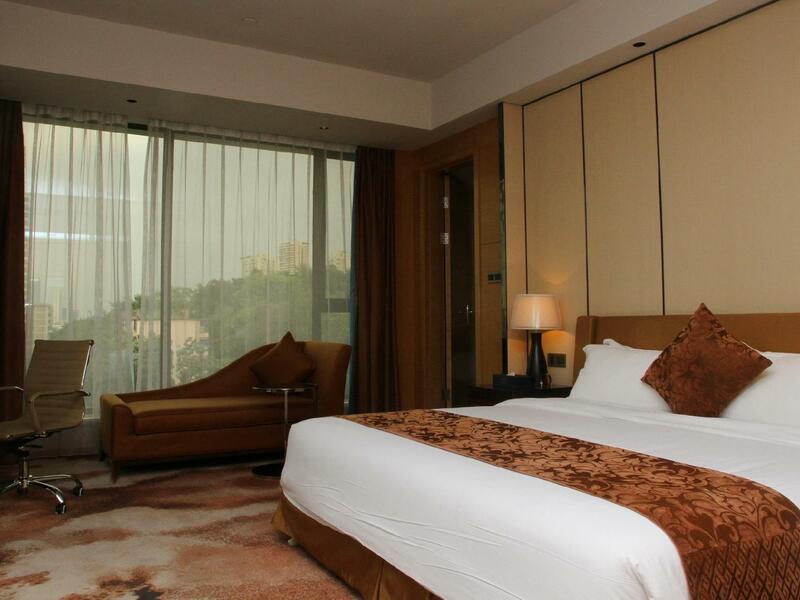 If i am coming back for Pazhou exhibitions, I will definitely return to this hotel. Stay in for 6nights, worst things is there is no internet, hotel claim that it's spoil. The entire stay with no internet access keep using my 3G and spent a few hundred on it. Other than this issue everything about this hotel is good. 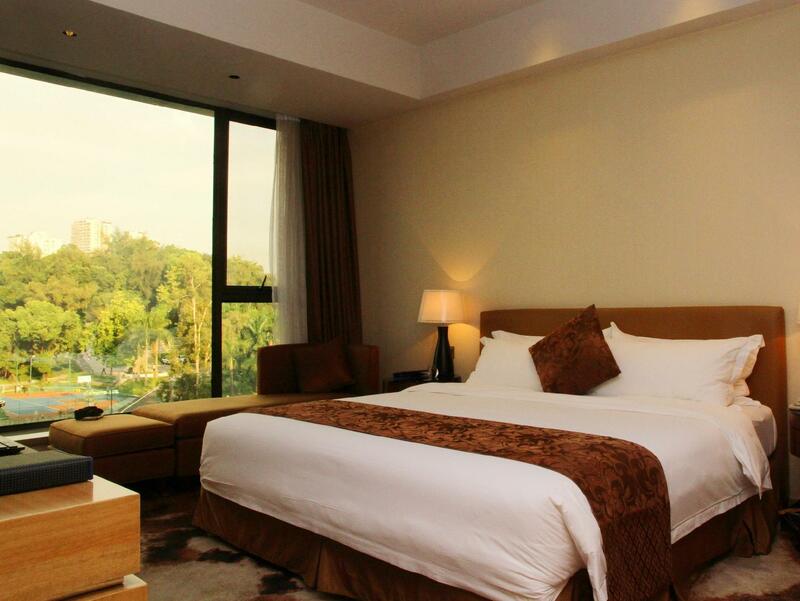 Price is reasonable during the peak period and the location is superb for Canton Fair goers. Right next to a metro station and just 2-3 stations away from the CF venue. Sanitary is better than my expectation . Be aware it's inside a hospital's premises--tell your taxi driver about this and look for a sign with the hotel name at the hospital entrance. I think this hotel should not cater to foreigners. It seems that they only want to cater the locals. I've read the reviews before i booked the hotel and was informed of the language problem. I just thought that by this time they could have done something about it. Specially that they are a hotel that caters to Canton Fair buyers. But this is the worst in terms of communicating with their staff. Giving me wrong translation for directions. I missed my appointment. That was bad...really bad. My room is on the 4th floor, its very noisy every night, also the door open-close are so loud, which i cannnot sleep early until midnight it will slow down. I won’t recommend for the ones who need to travel for business occasion cuz u will not get good sleep. Good location for a business traveller to the canton fair. Although not much to see in Chigang, Kecun is very close and Tianhe not far either. The staff almost did not speak english at all, but were helpful and polite. The breakfast was neither good nor bad. 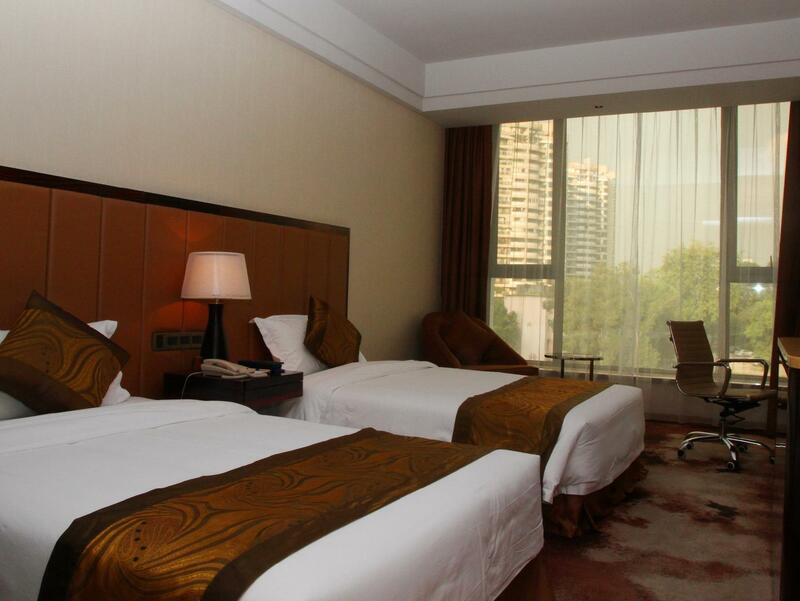 Based on the normal room rate, the hotel is a very good value for money, but of course during the canton fair all hotels nearby double their rates. 3 min. walk to train station and very convenient for Canton Fair ! Since this hotel is located in the hospital area, you need to go into the hospital gate or arch and it is not easy to find it. But reasonable and very convenient !! I would stay at this hotel next time too. This is good hotel. Very clean and neat. Close to the Chigang station. It is in the hospital zone. the map on the google or agoda is wrong. Some texi drivers may not know the hotel. People in hotel doesnt speak English much enve at the reception, but they are very kind. If you go during the weekend please avoid top floor they usually have event on the hole at the top floor where they have event hole. it is very loud till 11 at night. They dont have freeze. They have convenient store very close to hotel but they close at night. Safe enough. Not very famous place for tourist. In difficult circumstances, and a very busy time, found this hotel to be friendly. clean and a warm and welcoming retreat. When everything else promoted stress, the staff went out of their way to make the time as pleasant and relaxing as they could. Great. the staff cannot speak English very well, so if you require more than just basics of checking in then you might have some troubles. The hotel is nice, clean and quiet. the staff are overall very friendly. Price is not expensive but overall experience is also low. Hotel's actual location on location on Google map is different so took me 15 minutes walking with heavy luggage to find the hotel. Receptionists speak very little English. Breakfast was OK considering the price. Room is clean but I kept on stepping into sharp carpet holder in the room. Didn't get hurt though but kind of annoying. I checked in very late that time and they gave me a room with no window. The first day had water problem where there was only hot water. It's kind of painful when I came back from work outside and expect to have a cold shower. The days after we're fine. I could not find any decent restaurant nearby, only saw KFC and McDonald's. The hotel is s few minutes walk from a subway station. The hotel can help you get taxi. Value for money was satisfied. The room had a great interior, big bed for a couple like us, nice restroom. Mtr was 5 minutes away, and the hotel was also near the pazhou convention center. Many food stalls around the area. Good location for Canton fair and metro.